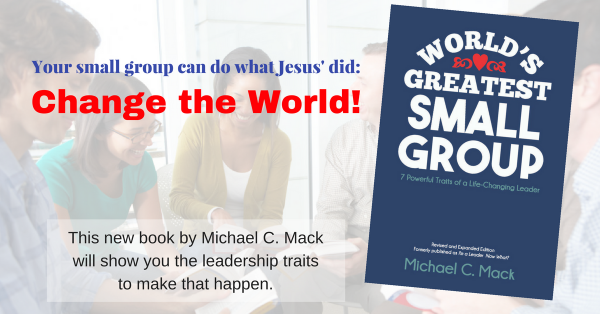 Michael C. Mack founded Small Group Leadership, LLC in 2012 from his home in Pewee Valley (near Louisville), Kentucky. Michael has been involved in small group ministry for nearly 25 years, serving as a small groups and discipleship pastor in churches in Ohio, Indiana, Kentucky, and Idaho. He founded SmallGroups.com, now owned and operated by Christianity Today, in 1995 and continues to be involved as an Editorial Advisor and writer. Through Small Group Leadership, Michael leads small group conferences and seminars and does other small group training, consulting, and coaching in churches across the United States as well as in other countries. He writes books, magazine articles, and blog posts to help small group leaders and church ministry leaders lead healthy, disciple-making groups. He writes small group studies for several Christian publishers, other ministries, and churches. 1. Stewardship: We partner with God, who owns this ministry. We manage and lead from the 2nd chair. 2. Love: We do everything as an expression of love for God, his church, and the lost. 3. Servant-Leadership: We are here to serve our clients. We put their needs first. 4. Mission-Focus: We seek first God’s kingdom and completing his mission. 5. Revitalizing: We desire to revitalize Christ’s mission in his church (in the lives of ministries, groups, and individuals). 6. Community-Building: The environment for the ministry and a main strategic aim is radically real community. 7. Integrity: We do everything with radically high character. The ministry will seek to remain above reproach in all its marketing, sales, and financial transactions. 8. Train & Trust: We train churches and groups to train and trust, and we hold to this value internally as well. We will train people to carry out their responsibilities and then trust (with early verification and coaching) them to do it well.